Vintage Indiana Blue Carnival Glass Creamer "Windsor"
Does not appear to have been used. No punch bowl. Blue Carnival Glass Footed Console Bowl. Pat tern: Harvest Grape. Shape: Oval. No box or paperwork. Fenton Lily of the Valley Iridescent Opalescent Blue Handkerchief Vase 7"
The tray is in excellent condition. The tray is 13 " wide. 1 Glass 2228 Pitcher - 10" tall. 4 Glass 0175 Cooler Glasses - 5 7/8" tall. Overall glass itself in very good condition, with light use. They have a beautiful blue iridescent hue and range of colors. Carnival Glass Candlesticks. Pair of Indiana Harvest Grape. Blue Iridescent Shine. While not the most rare of carnival glass collectibles, they have a classic and beautiful look. No cracks. Nice shine. This pattern is often referred to as Harvest Grape. Indiana Glass produced this pattern in t he 1970’s. The Cream and Sugar Set is in excellent condition. Like most Indiana glass, it is thick glass. Appears never or lightly used. See photos for exact condition. Item 5431. It does have the Fenton logo on the bottom. It stands 5 1/8" tall. Fenton Lily of the Valley Iridescent Opalescent Blue Bell 6"
It still retains the original Fenton Sticker. This Bell is in Wonderful condition. It is a carnival blue color and iridescent. This unmarked Indiana Glass piece has circle/valve mark on the back which one of the indicators of the maker. It is such a pretty iridescent blue. Unmarked Fenton ice blue iridescent glass bell. Vintage set of 4 new in box, Indiana Glass Co blue iridescent carnival glass Harvest Grape footed 9oz goblets. Mint, never used with no flaws. Box is in wonderful condition showing light signs of shelf wear. Measurements: 5.5” tall Thanks for stopping by! THIS CARNIVAL GLASS CANDY DISH IS IN EXCELLENT CONDITION. You are looking at a INDIANA GLASS BLUE CARNIVAL BICENTENNIAL INDEPENDENDENCE HALL PLATE. Item # 1962. Pre-owned in great shape. quote before you buy. Inventory location: front office case 6. If you have a problem with your item or feel that you can not. Our goal is to provide you with a Superior Product and Excellent Service. Indiana Carnival Glass Iridescent Blue Wedding Candy Bowl Grape 1970's in Box. Shipped with USPS Priority Mail. Vintage Indiana Glass Iridescent harvest blue color on this carnival glass goblet with grape on vine pattern. It is in GREAT condition NO chips or cracks and measures 5.25" x 3.5" top x 27/8" base. PLEASE REVIEW PHOTOS CAREFULLY BEFORE PURCHASE, Thanks. This set of 2 Indiana Glass Co. You can actually see the colors shade shift in each picture. Both pieces are 4" tall x 3 1/4" wide. ITEM IS IN MINT CONDITION. Pressed/Pat Gls, Carnival. This is a stunning glass. It has a few scrapes, but the beauty of the piece is all one sees. Special Characteristics: 9 OZ. Indiana Glass #2211. Iridescent Blue Carnival Glass Oval Bowl. The only Indiana Glass Harvest pattern with more than just grapes & leaves. Designed with grapes, leaves & other fruit (peach or apple?). Blue with gorgeous iridescence and a raised grape and leaf pattern all around. Signed with the V in a circle. 1 Oval Bowl approx 12" long. Very good condition for its age. 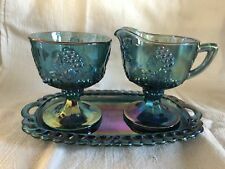 Indiana Blue Irresident Carnival glass, harvest grapes creamer sugar and handled tray. This beautiful massive thick colored glass Pitcher, approx. 8-1/2" across, from the tip of the spout to the tip of the massive handle. It is heavy and weighs approx. 5 Lb 6 Oz. This lovely thick colored glass Goblet/Cordial approx. It is plate #1 titled "A Pertridge in a Pear Tree". It is Cobalt blue glass with a beautiful carnival finish on the front. Marked on bottom. #7 in the series of Christmas plates, "seven swans a'swimming". 8.5" across and 1" high. No condition issues. Beautiful blue large candy dish or powder box. No markings. Carnival glass in original box. Goblet is in excellent condition as well as the original box. No cracks or chips. Candle can be removed as seen in picture. Not sure if it is the original candle. Stands about 5 inches tall. For sale is this beautiful " Imperial" Pressed Glass Pedestal Dish, Compote in a Deep Electric Blue Color with Ruffled Edges. There is a factory flaw, an approx. It is on the inside bottom of the compote. Iridescent Metallic Blue Harvest Grape Carnival Glass Footed Oval Bowl Stunning! It is in like new condition with no signs of wear that I can detect. Everything is sold in “as is” and “as found” condition.